PDG are happy to announce that a planning application has been lodged for our upcoming project. This is an exciting milestone in the design development phase of this project. We would like to take this opportunity to thank the teams who have contributed to date, as well as to the City of Melbourne. We look forward to developing our concept for this project further. Our West Melbourne project is located adjacent to the North Melbourne train station and will feature a collection of apartments, townhouses and retail. PDG is pleased to announce that we are working in collaboration with architects DKO to create a concept that is befitting of such a prime location. “Our proposition for West Melbourne celebrates the history of the site as a tin-making factory. 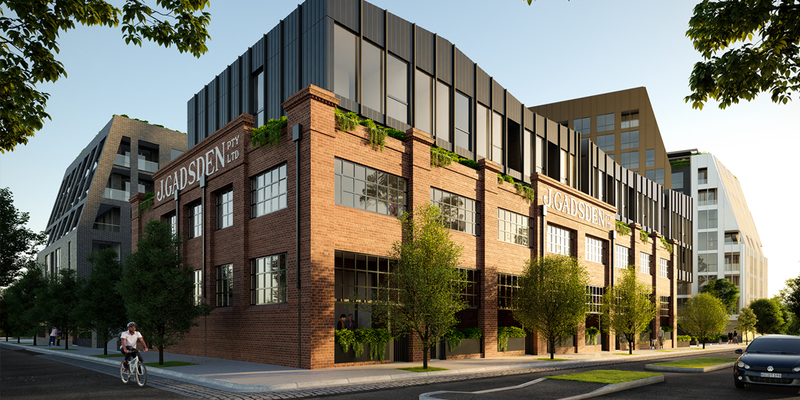 The concept draws on the urban grain unique to West Melbourne and the suburb’s transformation from an industrial area to a highly desirable mixed-use precinct in close proximity to Melbourne CBD. The composition of distinctive buildings which step up from east to west and from north to south create an authentic response to the grain of West Melbourne. The buildings frame a generous landscaped courtyard to the north with a mixture of sun-soaked lawn spaces, large canopy trees and intimate pocket parks. The existing J. Gadsden building is renovated and completes the urban village. New double height lofts are added on top and within the warehouse. The exceptionally high ceilings and large steel-framed windows are retained and form part of the interior of the proposed warehouse lofts – which are all dual-fronted with views to the north and the communal courtyard to the south.